Providing at least 50 hours of classroom material, this course builds financial language and teaches students about key financial concepts. 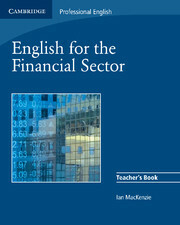 English for the Financial Sector also focuses on the communication skills necessary for working effectively within the industry. It covers a wide range of financial topics, including retail and investment banking, accounting, trade finance, and mergers and acquisitions. The Teacher's Book offers valuable background information on financial topics to help teachers prepare for lessons. A Student's Book and Audio CD are also available. 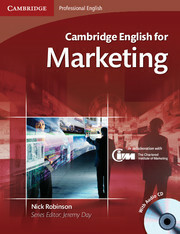 Endorsed by the Chartered Institute of Marketing (CIM), this short course (40-60 hours) uses practical tasks and realistic scenarios to develop the specialist language and communication skills needed for a career in marketing.